Discussion in 'The War Room' started by Blackened, Jul 31, 2016. Asian's and whites are discriminated against almost equally by medical school admission boards. Asian/whites have to have much higher credentials to statistically have a shot at medical school. Quit saying white privileged/guilt/whatever. Data provided by AAMC. "For those applicants to US medical schools last year with average GPAs (3.40 to 3.59) and average MCAT scores (27 to 29), black applicants were almost 4 times more likely to be admitted to medical school than Asians in that applicant pool (81.2% vs. 20.6%), and 2.8 times more likely than white applicants (81.2% vs. 29.0%). Likewise, Hispanic applicants to medical school with average GPAs and MCAT scores were more than twice as likely as whites in that applicant pool to be admitted to medical school (59.5% vs. 29.0%), and nearly three times more likely than Asians (59.5% vs. 20.6%). Overall, black (81.2%) and Hispanic (59.5%) applicants with average GPAs and average MCAT scores were accepted to US medical schools for the 2015-2016 academic year at rates (81.2% and 59.5% respectively) much higher than the 30.6% average acceptance rate for all students in that applicant pool (see bottom of highlighted dark blue column)." *To explain the following graphs since some people are having trouble with it. If you are white/asian with a GPA of 3.5 and an MCAT of 25, you have about a 17% shot of getting in, historically. If you are black/african american with a GPA of 3.5 and MCAT of 25 you have around a 75% chance of being accepted. SomebodyElse, Sakuraba808 and dissolved like this. I tried to follow the link to the graphs and it didn't send me to the right place. Do you have a link to the data that's not a forum? Additionally, the forum seems to suggest that there isn't a problem here. It says that there are only 5% more URM accepted than their scores should suggest. 5% doesn't strike me as indicative of the broken system but I suppose the counter argument is that it should be 0%. To which, I'd ask: It's 5% based on MCAT's and GPA. Do we know that there's no other value added indicator in effect that has nothing to do with race? Because 5% is pretty small. I'd think that if they were discriminating, you'd have a larger effect. It's posted in the forum. The moderator made it in the graph. Data straight from AAMC. I just didn't want to take credit for the guys work. Read what you just wrote again. I think you aren't understanding the data. Edit: The use of the phase "only 5%" bothers me. Oh yeah. I remember arguing with a dude here once and he got to the point where he said he just didn't trust the AAMC data. Lol. I'll consider that a victory. If you're a white dude and get a 23 on the MCAT you're not getting into any American allopathic medical school unless you donate over a million dollars, your dad is the dean, or you cured cancer. But that's an acceptable score for a significant minority of applicants if they're black/Native American/Latino. The data shows that. SomebodyElse, punky brewster, Blackened and 2 others like this. The United Nations deemed the Visible Minority act as racist but it still is used. When one combines the above with immigration revisions, Canada's European Caucasions (oldest community outside of aboriginals) are being clearly handicapped in employment practices. Even Arabic caucasians are not considered visible minorities (which is different than in the US). Further to this, European Caucasians are significant minorities (often resident European Caucasians are in Old Age Homes skewing stats) in many of Canada's cities (usually suburbs of the biggest cities) - basically the visible minority representation is based on the whole of the country (all rural and small cities included) and isn't based on the large city centres. I wish I could post better on this (am on my phone and super busy), so if anyone has the time and energy feel free. I understand the graphs just fine. Then I read the sections where he discusses his findings. Specifically, the proportion of seats going to URM's. He titles it "Are underrepresented in medicine (URM) applicants with less-competitive stats taking large numbers of slots from overrepresented in medicine (ORM) applicants?" His conclusion is that it's ~5%. So, if I'm supposed to take the data on it's face without a link to original data that the graphs came from, I'm also going to take his conclusion on it's face. And that conclusion is that it's 5%. Asians have a 32.8Q on the MCAT and a 3.73 GPA. Whites have a 31.8Q on the MCAT and 3.73 GPA. 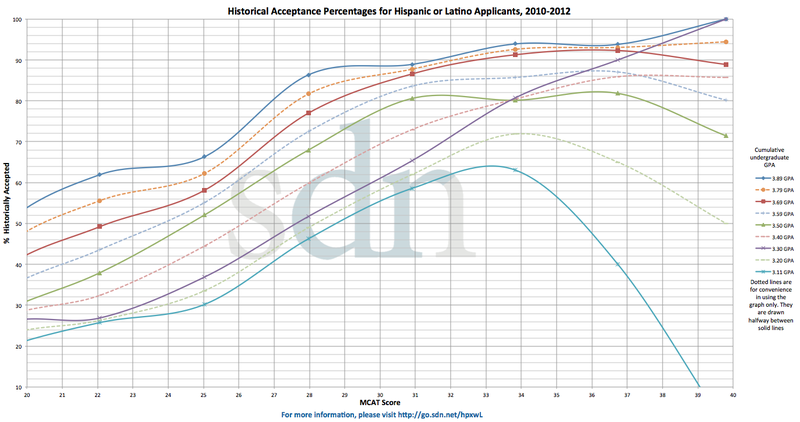 Hispanics have a 28.0P on the MCAT and a 3.59 GPA. Native Americans have a 27.4M on the MCAT and a 3.51 GPA. Blacks have a 27.3O on the MCAT and a 3.48 GPA. Now, what are your chances of matriculation if you've got a 27O and a sub 3.5 GPA? 20.6% if you're Asian, 29% if you're white, 81.2% if you're black. How about a 25 on the MCAT and a 3.30 GPA (really, really bad)? 5.9% for Asians, 8% for whites, 56.4% for blacks. Someone's forgot to tell these medical school application committees about white privilege. Lubaolong, SomebodyElse, dissolved and 1 other person like this. Apparently you don't understand the data. Then explain to me how the data and his conclusion don't intersect. You don't have to tell me, I know about it first hand. I am a white dude that doesn't have a shot in hell because of my race. I fall into that category of "you could get in if you were black but since you're white, we expect higher scores from you". I could "boost my application" by retaking some classes or something, but I'd be too old by then. Looking at grad school instead. I think affirmative action is like that in most industries. If you have a small portion of the population applying for the job, and in order to recieve government grants/money you have to have a certain % of that specific population its in your best interest to not hire a white male. Ive heard of (any ethn. )females even qualifying for specific state contracts as "minority" so the male business owners will sign the company over to the wife and give her a cake desk job and clean up on gravy contracts. Blackened and dissolved like this. Because I'm looking at it from a perspective of equality. Throw skin color/ethnicity out for a second. You are graduate with a 3.5 and a 25 MCAT score. What are your chances? Look it up. OK, now you are black, what are your chances? OK, now you are asian, what are you chances? You don't see how it's discriminating based on skin color/ethnicity? But that's not what he concluded. His written conclusion drawn from the data is that only 5% of the seats went to URM with lower MCAT/GPA combinations than their white or Asian counterparts. That's what he wrote, it's not my opinion. Are you arguing with his conclusion? If I was black I could get as low as a 3.00 average and have a 75% chance of acceptance given my score when I took it. 5% is 1000 cases of discrimination out of ~20000 cases. Sounds like systemic racism to me. SomebodyElse, Blackened, dissolved and 1 other person like this. 5%? I think that's far lower than would win in a court of law, especially without something to explain the 5% as linked to racial considerations.